Wikileaks Julian Assange. Flickr/ Surian Soosay. Some rights reserved. History is replete with disquieting figures, it is often difficult to know whether they deserve our support or mistrust. Julian Assange seems increasingly to be one of these figures. When I started writing about whistleblowers a few years ago, there was genuine sympathy for whistleblowers across international public opinion, and one sensed a common feeling of indignation at the repression whistleblowers suffered. But during the last few months, something seems to have changed. There now seems to be a real mistrust – if not outright hostility – with regard to Assange. The same cannot be said for Edward Snowden and Chelsea Manning: they each continue to receive widespread support from journalists, academics, and various advocates for human rights and freedom of the press. But what little support remains for Assange is now much more distanced and qualified. This shift in Assange’s reputation has been punctuated by several important moments. But nothing seems to have been more damaging for his reputation than the 2016 US presidential election campaign. Assange’s well-known dislike of Hillary Clinton, combined with Wikileaks’ publication of leaked emails from the Democratic National Committee (DNC), has led to the perception that Assange is becoming increasingly neoconservative, that he is moving away from progressive politics and democratic struggles, and moving closer to the political circles around Donald Trump and even authoritarian regimes such as Russia. Wikileaks is an institution based on generalizable principles... it is precisely these principles that we need in politics today. One can, of course, disagree with one or many of Assange’s actions or choices. But what we mustn’t overlook is the fact that important historical figures, like Assange, always embody or represent certain principles or values that transcend the particular actions of the historical figure itself. Wikileaks is an institution based on generalizable principles. And I argue it is precisely these principles that we need in politics today. It would be a major strategic error for progressives to distance themselves from Wikileaks. This is because Wikileak’s principles are in direct opposition to the reactionary sentiments and impulses fueling today’s populist backlash and the entire political system that made Donald Trump’s electoral victory possible. In other words, it’s a fundamental political error to casually associate Wikileaks with neoconservatism or reactionary populism. No affinity between these two worlds is possible; the political ideals brought to life by Wikileaks are a crucial form of resistance to Trumpism and the larger political culture in which Trumpism thrives. 1. Wikileaks is based on the value of knowledge. The organization functions almost like a group of historians of the present. Its institutional mission is to reveal the secret activities of political leaders and, in the process, show the public how states actually function and what they actually do. From this point of view, Assange inaugurated a new culture of truth, a politics of the archive and of knowledge, that is diametrically opposed to the logic of opinion, fake news, and the echo-chamber ideology of contemporary populism. 2. Wikileaks is anti-authoritarian. Its struggle for transparency is dedicated to opening the black box of government so that the public may no longer live in ignorance of the logics that guide the governments they routinely elect or live under. This opposition to all forms of authoritarianism places Wikileaks in a long and vigilant democratic tradition that opposes the centralized powers of the strong state. 3. Wikileaks is firmly committed to fighting censorship and the feelings of alienation a culture of censorship produces. And it is precisely this kind of culture of alienation that gives rise to reactionary populism in the first place. Today’s reactionary populism is largely anchored in a not unreasonable mistrust of the media, and the disproportionate power the media exerts over the selection and circulation of information. Wikileaks has consistently attacked the power that traditional media gate-keepers exert over the kinds of information or stories journalists are allowed to pursue and publish. Assange’s statements about the publication of the Panama Papers are a perfect example of this. Wikileaks is an advocate of total transparency. Wikileaks’ standard practice is to publish everything: they prefer to release the raw information they receive and let the public conduct their own analyses and come up with their own interpretations. Their opposition to media censorship and their refusal to see the public as merely passive spectators aligns with their belief in a vibrant public space, and this conviction has given rise to practices that concretely combat the widespread feeling of alienation that is too often channeled in populist directions. 4. Wikileaks nurtures an ethic of unconditionality. Julian Assange has been relentlessly criticized for publishing leaked DNC emails during the 2016 US presidential election, and then for weakening Hillary Clinton’s chances of electoral success. But shouldn’t we turn this criticism around? Our democracy is in decline today precisely because of our repeated tendency to suspend and defer democratic principles in the interest of achieving short-term practical objectives (such as in the “War on Terror”). Doesn’t this suspension of democratic principles ultimately damage democracy by undermining its basic unconditional character? And isn’t this tendency to play fast and loose with democratic principles eroding our faith in the rule of law? 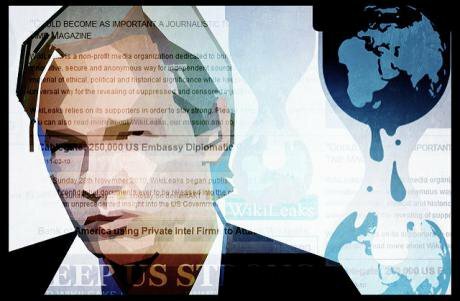 Assange and Wikileaks publish the documents they receive when they receive them – no matter where they come from or what the short-term political fallout may be. This ethic of unconditionality is especially important today for reviving our faith in the democratic ideal. 5. Wikileaks believes in a non-submissive culture. The culture of leaking and anonymous denunciation encourages people to distance themselves from the institutions to which they belong, to question their institutional identification, and to maintain an attitude of perpetual institutional skepticism so that they may denounce any potential wrongdoings or crimes. This culture of non-submissiveness, of non-allegiance, is in radical opposition to authoritarian forms of government and forms of nationalistic identification. 6. Lastly, Wikileaks amounts to a practical critique of all of forms of nationalism, insofar as its concrete practice actively promotes an international conception of politics and belonging. Wikileaks assembles people from all over the world who are fighting for a shared ideal that extends beyond national boundaries and affiliations. Wikileaks, in other words, is a project that transcends the idea of nations, and it works to dissolves the nationalistic basis at the root of all conservatisms. But more importantly, Assange is one of those rare contemporary political figures to adopt a truly global perception of the world. In all my public discussions with Assange, I was always struck by his ability to take a global perspective on the world, and his consistent capacity to think that whatever is happening in Great Britain is no more important than events in South Africa, Ecuador, Yemen, or Russia. Someone once told me that if Snowden enjoys greater sympathy than Assange in Western Europe or the United States, it’s because Snowden’s leaks involved predominantly white Westerners, while much of the information WikiLeaks publishes involves Yemenites, Afghans, or Iraqis. I think there is much truth to this. These systems of power and ideologies can only be fought by new practices and new subjectivities created within new political systems. Populism, nationalism, conservatism, and authoritarianism can’t be fought with ready-made speeches. These systems of power and ideologies can only be fought by new practices and new subjectivities created within new political systems. The rise of contemporary reactionary populism isn’t an accident or an aberration, nor is it simply a case of manipulated public opinion: it is the product of our dominant political and media systems. Yet we are somehow expected to critique Trump, and the culture of populism that produced Trump, from within the confines of the very system that made him possible. This is the singular impasse facing progressive politics today, and this is precisely why we should be cautious about our critiques of Wikileaks. We need to defend and support Wikileaks’ project today more than ever. The principles upon which Wikileaks is based are the very same principles that are needed today to create a new political culture: principles of transparency, anti-authoritarianism, internationalism, non-submission, and unconditionality. Of course, the lives of political actors, much like our own lives, are always complicated. But the principles through which Wikileaks acts inscribe the organization in a long history of struggle committed to enlarging the democratic horizon. At a moment in history when the CIA has explicit plans to terminate Wikileaks, both Julian Assange and Wikileaks deserve support from progressives. If progressives want to defeat populism, they should stand with WikiLeaks. Thanks for the translation go to Matthew MacLellan.